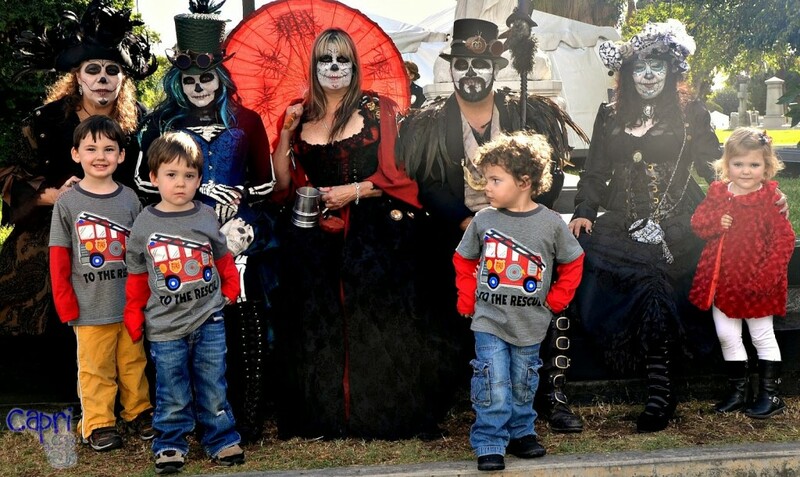 We went as a family to the Dia de los Muertos celebration at the Hollywood Forever cemetery. It is an amazing annual event and I would highly recommend it if you are ever in the Los Angeles region at this time of year. 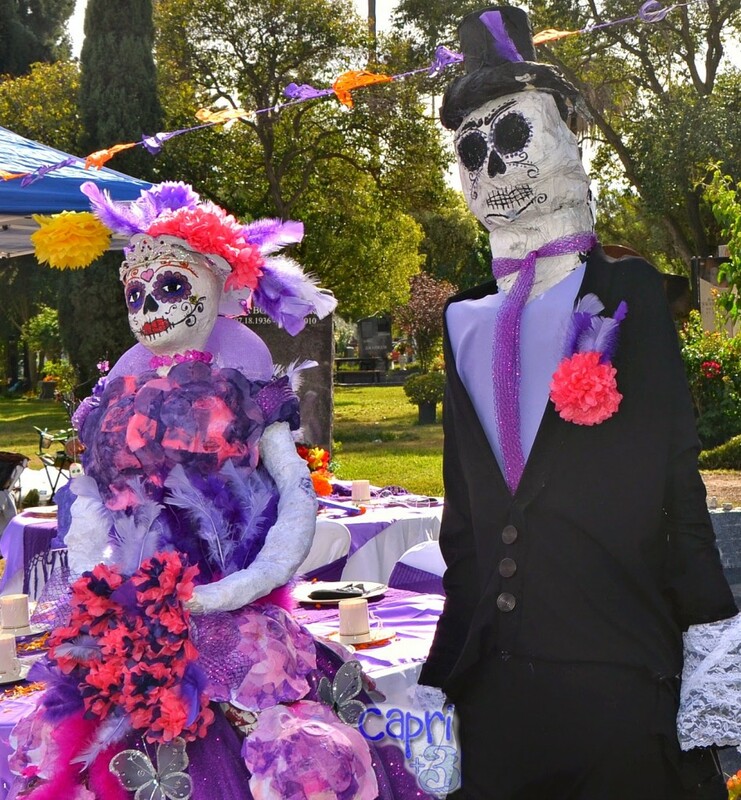 We talked to the Sugar Snaps about Dia de los Muertos and the way people honor their ancestors by creating beautiful altars and wearing special costumes and make-up. We reminded them of the ways we honor their Nana and Papa by bringing flowers to their graves and having picnics. They were fascinated by the beautiful altars, costumes, make-up and dancers. This is one of the many beautiful altars at the event. 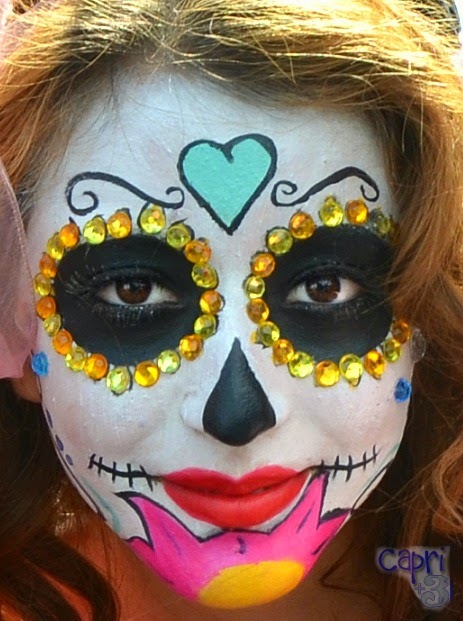 Marigolds are culturally the flowers of the dead and can be seen throughout Dia de los Muertos celebrations. These beautiful costumes were made by the children’s father. He graciously allowed anyone who asked to photograph his children wearing these incredible costumes. The theme for this year’s festivities was Quinceanera to mark the fifteenth year at this location. 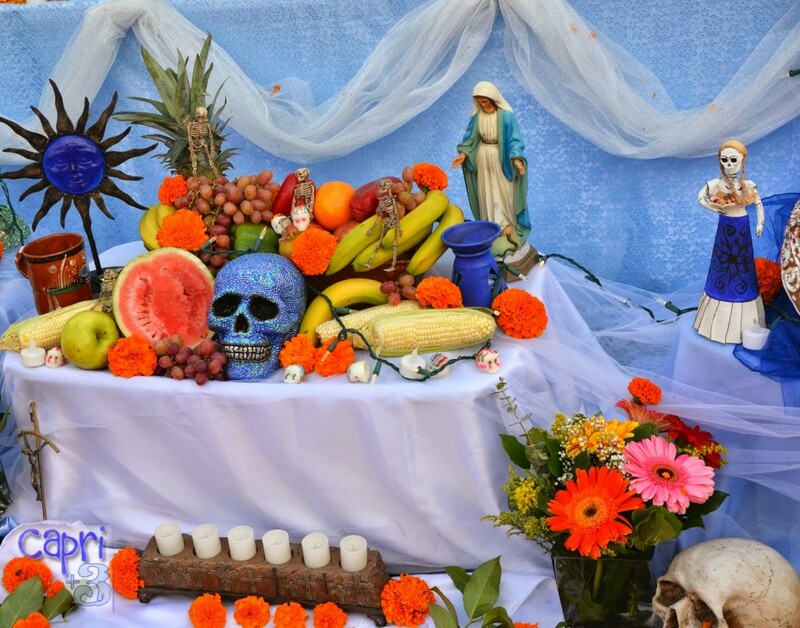 This beautiful altar “represents the cultural wealth of [the] students and their families” who attend Para Los Niños Charter Elementary School. This beautiful work was done by a first grade class! The Sugar Snaps were very impressed that children made it. 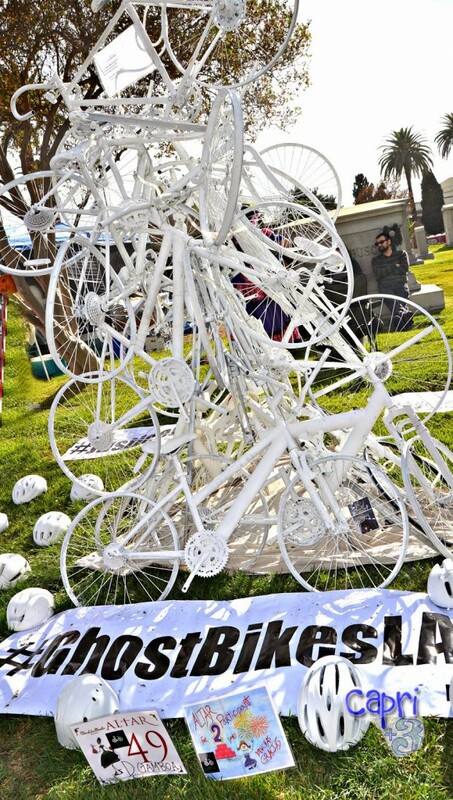 This altar represented Ghost Bikes LA. When a cyclist is killed due to being hit by a car, volunteers paint a bicycle white and leave it at the location where the cyclist was hit. Often times, an altar forms around it full of flowers and notes. We discussed the concept with the Sugar Snaps that drivers sometimes do not make good choices and are distracted while driving and hurt people. Capri was excited to meet this “beautiful princess” at the event. I was impressed that she, and everyone we met, was so gracious. People were warm and friendly and were happy to have us take pictures. 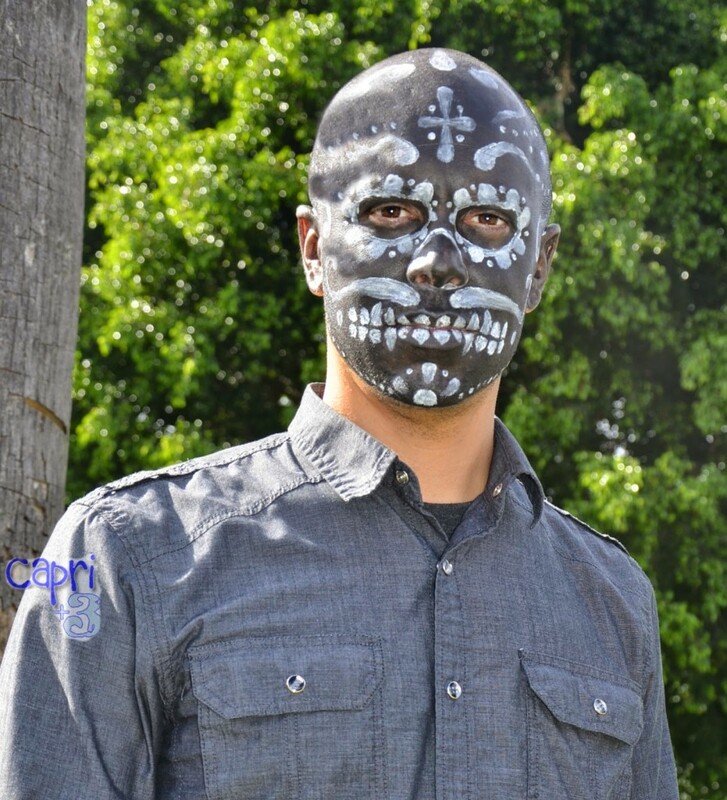 This man was very nice and allowed us to take a picture of his awesome make-up that covered his entire head! 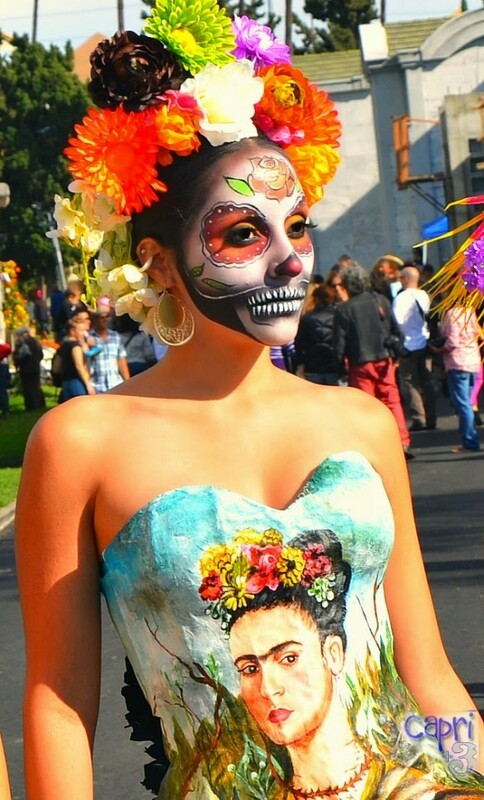 Frida Kahlo was a popular image on the elaborate dresses of women at the event. They frequently paused so that groups of people with cameras could take their pictures at once. 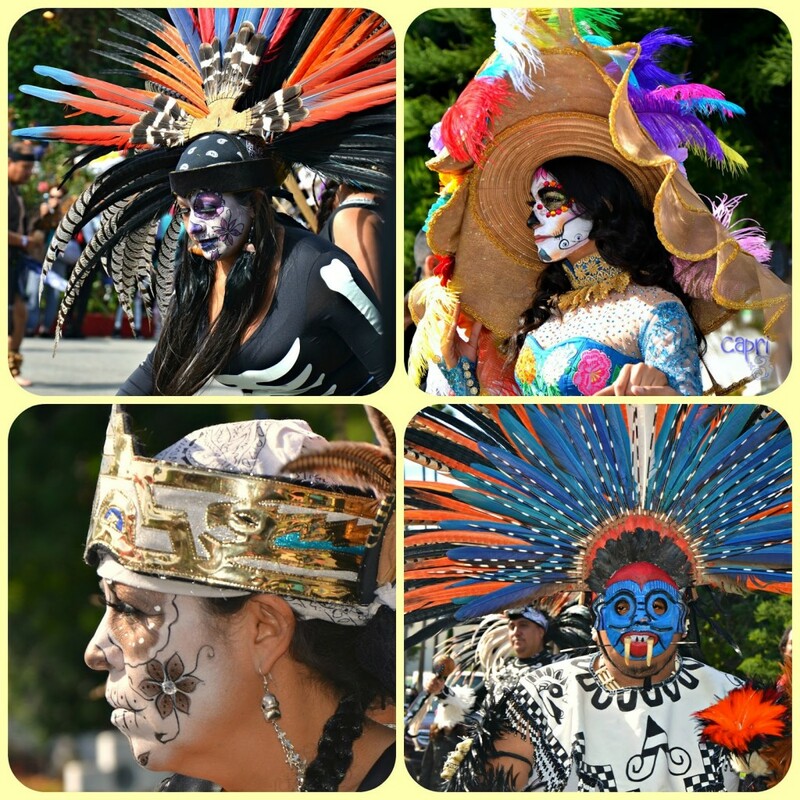 These are some pictures from the dancing and processions that came down the walkways at the festival. 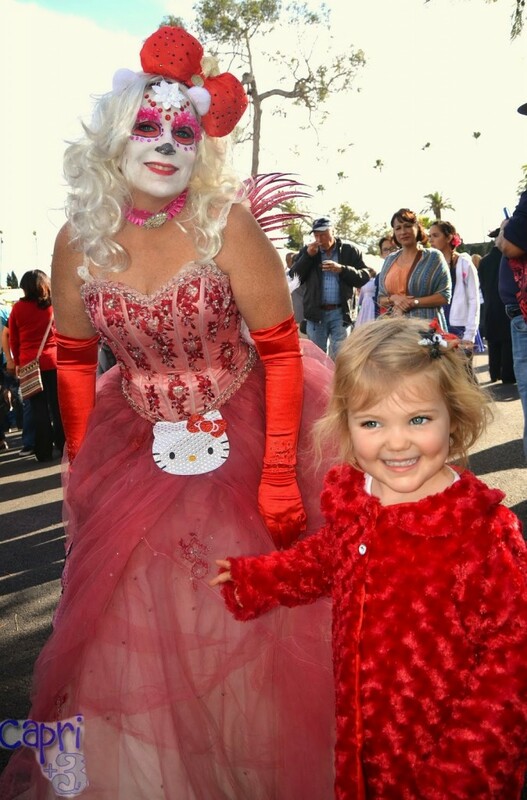 The elaborate make-up and costumes were breathtaking and were enjoyed by people of all ages. Capri spotted this woman and exclaimed, “Look Mama it’s a princess and she’s beautiful!” I asked her if I would take her picture with Capri and she warmly agreed. As you can see from their expressions, the Sugar Snaps all had different feelings about posing with this nice group of people in elaborate costumes and make-up. We considered having the Sugar Snaps’ make-up done until we inquired and found out it was $30 per person which is more than the cost of the event. Our tickets were $20 a person and the Sugar Snaps were free because it was prior to 4 p.m. Next year, I would like to attend again and do their make-up myself. They all love having their faces painted. 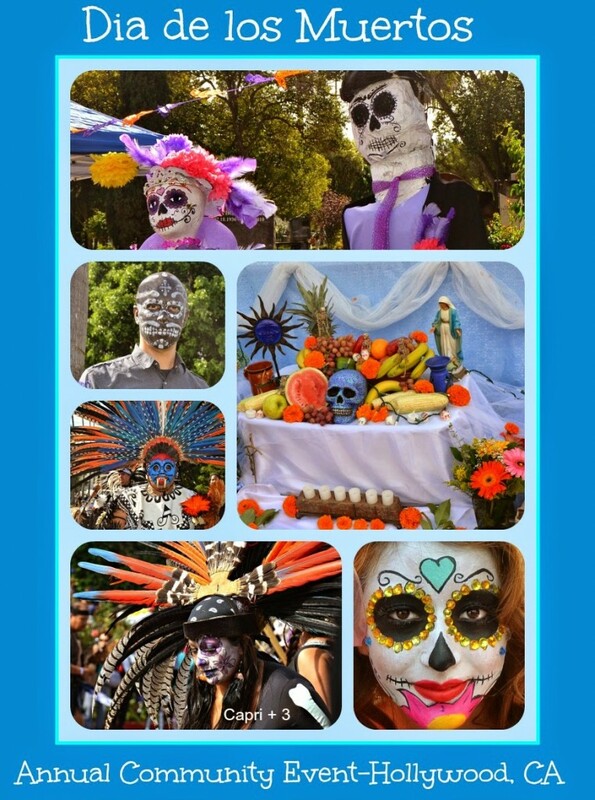 I am going to extend the learning and have the Sugar snaps color some pictures using these awesome FREE SUGAR SKULLS COLORING PAGES FOR DIA DE LOS MUERTOS generously provided by Frogs, Snails and Puppy Dog Tails. 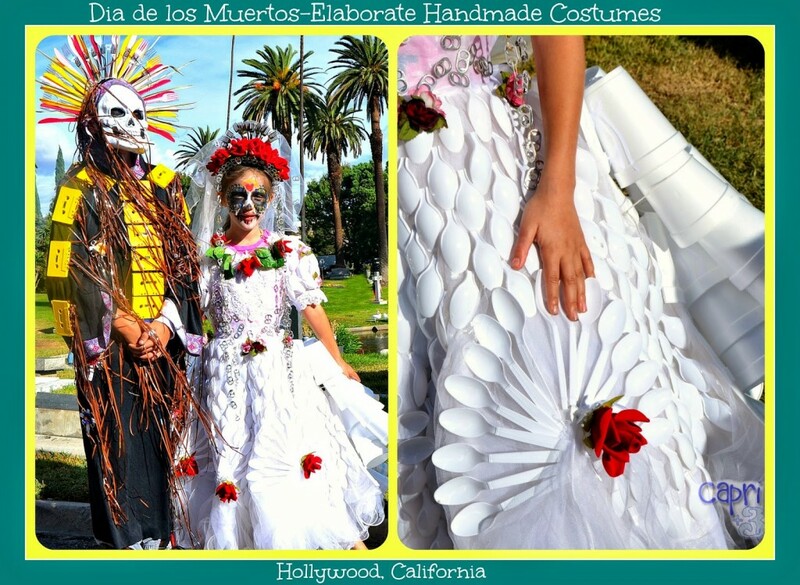 Have you ever been to a Dia de los Muertos event or tried activities related to the event? Feel free to share in the comments. Your comments are welcome and appreciated. What an amazing event! I live not too far from Hollywood so it's something I'll keep in mind. When the date comes out, mark your calendar for next year. It is only a one day event! Hopefully, that will change to include more days. 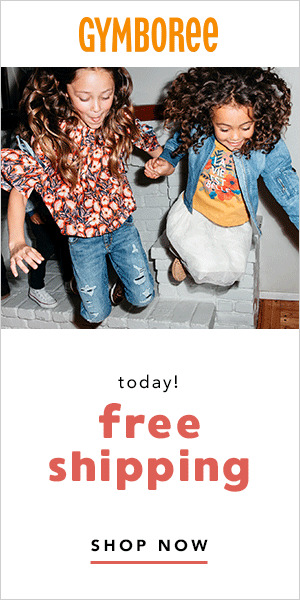 It is really fun and younger kids are free before 4 p.m.
That looks like it was a lot of fun! I absolutely LOVE the makeup and the outfits! Wow! Amazing pictures! The makeup and costumes are just wonderful. I would love to go to this event… too bad I'm on the East Coast! I love the make-up and outfits too. So fun. Thank you. You might have a similar event near you. I know they happen in many places. SO pretty yet scary too!! I wondered if the kids would be scared of full face make-up. They all loved it! Stunning – amazingly vibrant colours! Love the make up too!! We were amazed by the colors and elaborate costumes too. I can't wait to try to do the make-up myself on the Sugar Snaps next year. It should be fun. (It would cost $120 to have it done there). This is incredible! Definitely an amazing way to celebrate the day. It was a wonderful way to spend the day. We look forward to returning next year.